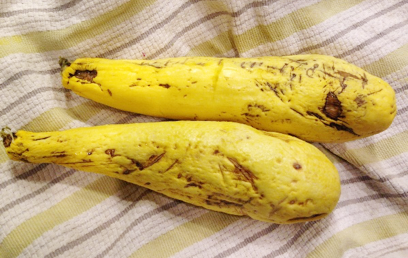 I’m starting off this blog with a less-than-appetizing image of yellow squash to show you that “mostly dead is not all dead,” to paraphrase a line from The Princess Bride, when it comes to vegetables. The history of these sad-looking squash is really one of poor planning. I don’t like yellow squash (too seedy and squishy when conventionally cooked) but my husband bought it and, well…I hate wasting food. Regarding this particular dish…I love pasta, but don’t eat it so often. 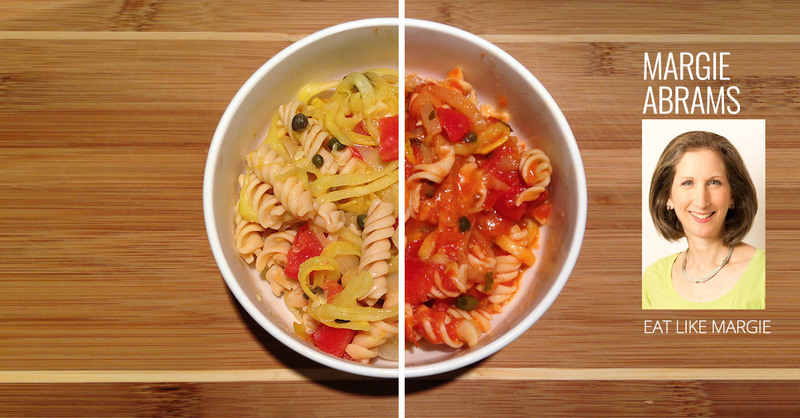 Even though I’ve found gluten-free pastas that I love, it’s still a lot of mostly-empty, starchy calories. The texture of the chickpea pasta is actually pretty good and any weirdness in the taste (it is CHICKPEA pasta after all) was deliciously hidden by the spaghetti sauce. More pluses: It is a good source of protein (14 grams per serving), and it cooks in only five or six minutes! For those who don’t like red sauce, there’s plenty of flavor without it. Cook pasta according to package directions. If you’re speedy, you can almost do everything else in the time it takes to boil the water and cook the pasta. Spiralize the squash over a cutting board. Then cut a “plus” through the pile to make the shreds a manageable length for cooking and eating. If your spiralizer has a choice of widths, use the larger-sized one. I know they sell whizzy-bang spiralizers, but the one I use is inexpensive, works well and takes up very little space in the cabinet. 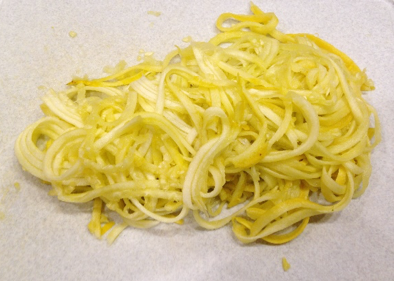 If you don’t have a spiralizer and don’t want to buy one, use a vegetable peeler to create linguini-like ribbons (peel up to the seeds), or use a mandolin to julienne the squash. Peel onion, cut in half, and then slice thinly. Aim to match the width of the zucchini. Warm up a large sauté pan on medium heat. Once hot, add olive oil (one to two tablespoons) and swirl to coat the bottom. Add onions and sauté until they start to soften (about two minutes). Hint: Use a large bamboo or wooden fork for sautéing ingredients like these (mine is technically a salad-serving fork!). It’s much easier for maneuvering the vegetables than a spoon or spatula. Add garlic and continue to sauté until translucent (about two to three minutes more). Add squash and continue to sauté another three minutes or so—you want the squash to be soft but not mushy. It actually will have a pasta-like texture. If you are using spaghetti sauce (I used a basil-flavored sauce), add that and stir until the sauce is heated through. Serve vegetables over the pasta. Top with cheese or cheese-style shreds if desired, and/or fresh herbs.